This article submitted by Linda Stelling on 12/16/97. Area musicians find themselves in demand during the holiday season. Besides the normal hustle and bustle of the holiday season, they add rehearsal time and concerts to their schedule. The Paynesville Area High School Pops Choir is scheduled to perform at six different functions between Thanksgiving and Christmas. They started off the season with a tree-lighting ceremony on Nov. 28 at the Paynesville Office of the Melrose Credit Union and will conclude their schedule on Friday, Dec. 19 by singing at the Community First National Bank. Cheryl Bungum, their director, has kept busy outside the school as well, with the Advent concert rehearsals and recent concert by the combined choirs of the Paynesville Lutheran and St. Louis Catholic Churches. The combined choir presented two concert one at each church. 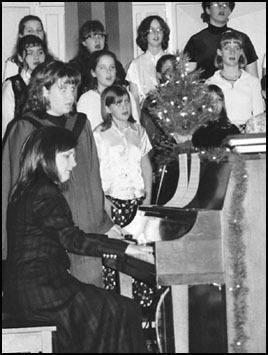 Pelton helped direct the Advent concert and a normal one-hour choir practice would turn into a two-hour practice or more. “You have 45 people changing their regular schedules to take on extra rehearsals the week of the concert,” he added. Pelton said he has learned to say no and turned down some requests because there are not enough hours in a day or week to get everything in, especially when you work overtime at work. Leah Norris is another musically talented Paynesville resident. “People see you at the programs and think what you do is easy. They forget there are rehearsals involved besides the concert, all which add up to a major time commitment,” she said. “When you look at the holidays a couple of months in advance, you don’t realize how hectic your schedule will be when you agree to help out with a program,” Norris said. Norris has accompanied the students at the elementary program last week and at the high school choral concert. She also played for a wedding and funeral that same week. Many musicians get burned out before Christmas arrives and find they don’t enjoy the festivities as much and lose the mood for a while. Cindy Zimmerman, Paynesville, said last weekend was hectic with their church Christmas program. “Music is a huge part of Christmas and the holiday season,” she added. Zimmerman will also be accompanying musicians at an adult talent night at her church, besides performing herself. The Paynesville area is blessed with many talented musicians who are busy during the holiday season. The community is thankful for the many musicians who give of their time during the holiday season and throughout the year.